Children, one more old story for you where you can see how two foolish goats were punished due to their ego. Now you might be wondering what is 'ego'. It is a very strong feeling of 'I'. Once upon a time, two goats were crossing a narrow wooden bridge over a brook in the opposite direction. When they came in the mid of the bridge, they were facing each other. The wooden bridge was very narrow and only one can walk on the bridge at a time. Both the goats cannot criss-cross. So one goat has to go back and give way to the other. But none of the goat was willing to go back and each one wanted to show its supremacy over the other. What is 'supremacy? It is a feeling that shows that 'I am great'. The goats had such a feeling and no one wanted to go back. What did they do then, what else? They started fighting one with the other in order to cross the bridge first. Alas! 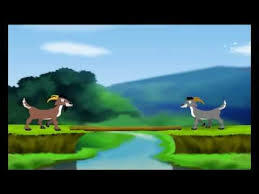 both the goats fell into the river and were drowned. So what lesson did you learn from the story? Moral: Try to be wise and try to come out of the strong feeling of 'I'. Be considerate to others which would prove to be good to all.